The National Highway Traffic Safety Administration (NHTSA) has proposed industry guidelines that ask automakers to create a way to block applications on smartphones or tablets that can distract drivers. Currently no safety guidelines exist for mobile devices when they are used while driving, the NHTSA said. The new guidelines, which were published last week and are in a comment period, instruct automakers to create a "Driver Mode" similar to Apple's Airplane Mode on iPhones, which takes the smartphone offline. The new guidelines are the latest effort by the federal government to reduce accidents caused by distracted driving. In proposing the guidelines, the NHTSA pointed to a rise in U.S. traffic fatalities and injuries in the past two years, a good percentage of which can be connected to drivers who are distracted by mobile technology, it said. In 2015, some 10% of the 35,092 U.S. traffic fatalities on record involved one or more distracted drivers, and those crashes resulted in 3,477 fatalities, an 8.8% increase from the 3,197 distracted-driving-related fatalities in 2014, according to the NHTSA. Of the 5.6 million non-fatal, police-reported crashes in 2014 (the most recent year for which this data is available), 16% were distracted-driving-related crashes and resulted in 424,000 injuries. The Centers for Disease Control and Prevention (CDC) defines distracted driving activities to include using a cell phone, texting, and using in-vehicle infotainment (IVI) technologies such as navigation systems. In 2013, the NHTSA published Phase 1 Driver Distraction Guidelines that focused on visual-manual interfaces of electronic devices installed as original equipment, such as infotainment centers. Those phase 1 guidelines included a definition for distracted driving as any "single average glance" that takes a driver's attention away from the roadway for more than two seconds or "where the sum of... individual glances" are 12 seconds or more while performing a testable task, such as selecting a song from a satellite radio station. The Phase 1 guidelines recommended that interfaces and tasks determined to be more distracting than its specified levels should not be accessible to a driver on the road. The proposed Phase 2 guidelines first recommend any mobile device be able to pair to an IVI system. The new criteria are focused exclusively on mobile devices that do not already meet the NHTSA "glance criteria" when being used by a driver. Those devices, such as smartphones and tablets, should include a Driver Mode that is developed by industry stakeholders including operating system or handset makers. 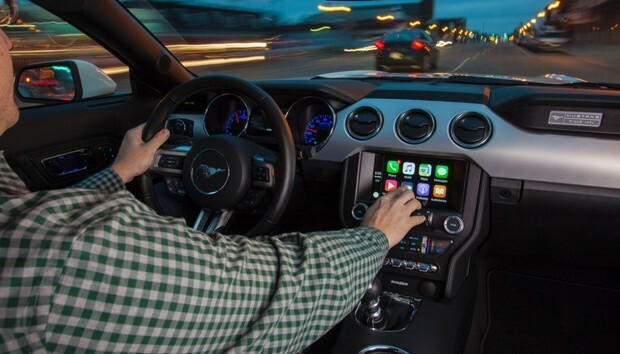 Automakers are already installing native technology such as Apple CarPlay and Android Auto that pairs a mobile device to an IVI system. Android Auto allows connected Android smartphones to mirror their mobile apps and functions to an in-vehicle infotainment center. By requiring that mobile devices first automatically pair to a vehicle IVI system, it would ensure certain activities -- such as videos, photos and text messages -- could be locked out while driving. "The Driver Mode should present an interface to the driver that conforms with the Phase 1 guidelines and, in particular, locks out tasks that do not meet Phase 1 task acceptance criteria," the NHTSA's guidelines state. "The purpose of Driver Mode is to provide a simplified interface when the device is being used unpaired while driving, either because pairing is unavailable or the driver decides not to pair." The guidelines recommend two methods of activating Driver Mode depending on available technology: Automatically activate the mobile device's Driver Mode when it's not paired with the in-vehicle system or allow it to be manually activated. The reason for the manual activation is to allow a passenger to use a mobile device without it automatically being placed into Driver Mode. While there are technologies that can detect whether a driver or passenger is using a device, the NHTSA said those technologies are currently unreliable and impractical. The manual activation mode is only a temporary fix until mobile-detection technologies are refined enough to distinguish between a driver and a passenger. "The agency is optimistic such technology can be implemented as soon as practicable," the NHTSA stated.